When practicing the guitar, there have been times when I got very demotivated and frustrated until I found out I was focusing on my mistakes instead of enjoying all the good licks I was producing on my guitar as well. I learned that focusing on the good things I play makes practicing the guitar much more enjoyable. The mistakes are still there, but my overall play gets better. This approach is fundamentally different because it is “strengths-based” instead of “deficit-based”. In Scrum, we know we will make things better through empiricism: We continuously inspect and adapt. However, over time it looks like the continuous improvement Kata loses its magical powers and becomes stale. Scrum Masters try to fix things by varying their retrospectives format, by introducing games and by introducing more creative problem solving approaches like lateral thinking (Dr. E. de Bono) to get better improvement results. In other words, Scrum will surface what problems we need to fix. To improve our value delivery, we identify problems, seek underlying causes and formulate solutions that might result in improving the situation. This approach is also known as the “deficit-based” approach to problem solving. By repeating this mantra over and over again, we unconsciously start to think that improving equals problem solving. We get tired of solving problems and we fail to appreciate or exploit the good things we have achieved as well. Appreciative Inquiry (AI) was created by David Cooperrider. To engage in change, he proposes to formulate an approach based on a vision of a perfect future state for the given situation created from collective positive past experiences. Social systems move in the direction of the questions they most persistently and passionately discuss. Organizational life is expressed in the stories people tell each other every day and is constantly being co-authored. What we do today is guided by our image of the future. Momentum and sustainable change require positive affect and social bonding. Appreciative inquiry is about expressing our beliefs through dialogue, aiming at building a positive future for our social system. 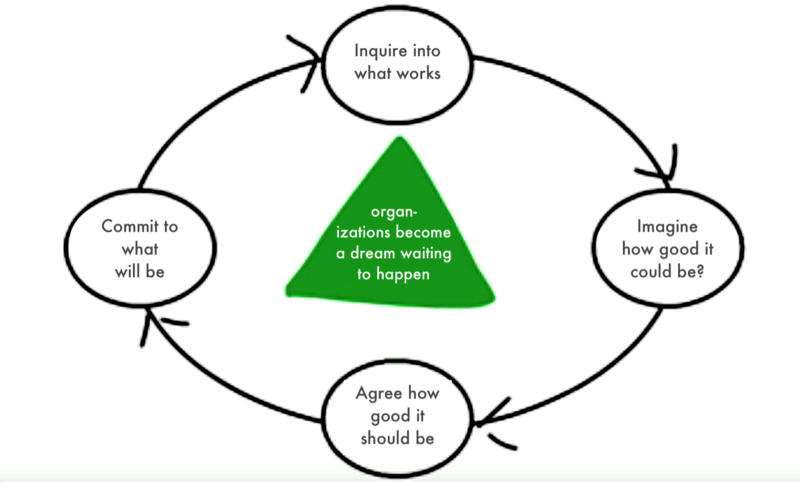 Instead of organizations being a collection of problems to fix, they become a dream waiting to happen. We focus on what works, imagine how good it would be and make it real. This is fundamentally different from the way most organizations tend to work nowadays. Some possible uses of Appreciative Inquiry are team formation sessions, exploring new product characteristics and retrospective format. In this article I will describe the example of a team formation session. Appreciative Interviews are interviews that are constructed on the Appreciative Inquiry principles. Applying the Appreciative Interview technique takes a bit of preparation (to prepare and test interview questions) and a well facilitated execution. I was working with teams that needed to flip from component-teams into feature-teams. We were dealing with a group of people who were extremely demotivated and change-numb. Instead of having management telling the teams what the new teams would look like, we chose to do a self-selection team formation session to create ownership. (The session itself is not the subject of this article. You can read more about the steps we followed as described by Sandy Mamoli). We were hoping that Appreciative Interviews would help us overcome the negative attitude towards change. Prior to the team formation day, Appreciative Interviews were conducted on a 1:1 basis by the Scrum Masters with all team members involved in the change. The interviews are 1:1 because it creates safety, everybody is heard and it brings us an intimate recollection of experiences. We prepared a set of interview questions to guide the interviewee to remember a great team experience, thinking about what and who made this experience special and how we could apply this to our current situation. Scrum masters collected the interview results and used colored markers to identify patterns (e.g. freedom, autonomy, clear goals, etc). The patterns and most inspiring stories we collected were combined in the opening talk of the team formation day. Some attendees chipped in and shared their experiences. The stage was set to move toward something new and more enjoyable for all of us. The people were engaged in finding new team-mates to recreate their best team experience. Introduction: (The Scrum Master explains) We want to collect cool past experiences of great teams to see what we can learn from that. The past experience: Could you share an exceptional empowering experience you had working in a team? What was the team name? Describe what was the assignment of your team? Values: Which of the people you were working with really stood out? What did these team members do so well that made this team feel empowered? What else besides these people made this team tick? Core value: Which core value was addressed in you working in this team? Future state: If you had three wishes for your current team here in our company, what would you wish for? Closing: The Scrum Master summarizes what has been said. ● Keep the interview very concrete. We need names and real people, not inventions. ● It is very important the interviewee talks about a past experience. If the interviewee cannot remember a great team experience, stop the interview. ● Spend time on formulating good interview questions. ● Practice the interviews among all interviewers until the questions and your techniques are in place. 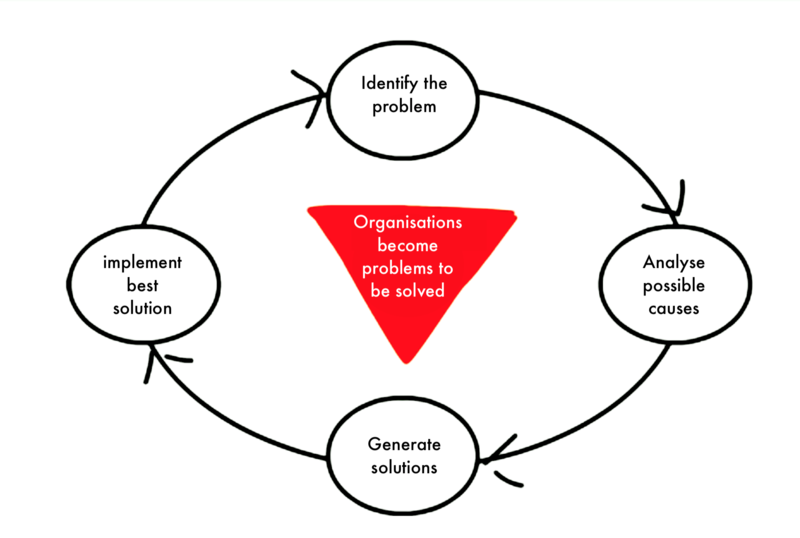 Appreciative Inquiry can deliver great value to Scrum because it triggers people to think creatively about issues and it releases them from the singularity of improving through problem solving. People share stories about their personal positive experiences and share their personal perfection vision. This is incredibly valuable and contagiously inspiring.